Maximize Your Bible Study Time - Quick as a Click! The Quickest Bible Search you can buy! If you need to Search the Bible and want to know every occurrence of a letter, word or phrase here is the best money can buy. 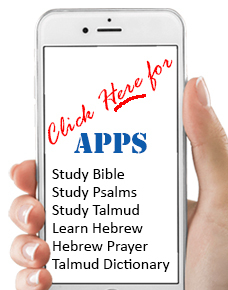 Get the instant results in Hebrew, English or both. The International Jerusalem Post rates Bible Scholar the Best Bible Searching tool available - Five Stars. From the land of the Bible by the People of the Book comes this most fantastic Bible Tool – if you study the Bible or do Bible Research you need this tool. It has blazing speed and accuracy. This program is the program of choice for anyone studying the Hebrew Bible. Whether you call it Chumash, Torah, Nach, Navie, Tanach, or Bible - Bible Scholar can make your study time MORE PRODUCTIVE. It will MAXIMIZE YOUR SEARCH SPEED. It’s fun, exciting, and most important it makes the Bible easier to comprehend. Bible Scholar helps you get control of the vast amount of information in the Bible. It gives you instant access to every word, name, law. Through its amazing HYPERTEXTING it permits you to link together all your thoughts as they come to you. It features a built-in Hebrew English Note-Taker and even a Voice Note-Taker which permits you to Type or Record your thoughts and link them to the exact spot in the Bible. A really great Bible Software Tool - worth a lot more than the Developers charge.